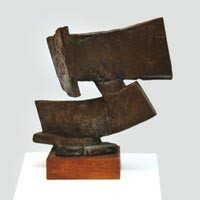 A retrospective by noted local sculptor Peter Calaboyias melds his Greek heritage and Modernist art. For 15 years, Peter Calaboyias' sculptures have gained attention mostly for the difficulties surrounding them. "Tribute," an 8-ton, fan-shaped bronze created for Atlanta's 1996 Summer Olympics, was damaged during the Centennial Park bombing. 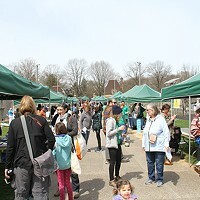 His 1971-72 work "Five Factors" was lost for 20 years following its removal from Squirrel Hill's Carnegie Library; its rediscovery and reinstallation, in Mellon Park, was cause for celebration. Still discussed heatedly is a proposal to substitute advertising for Calaboyias' "Silver Wall Grid," which has hung above the Pittsburgh airport escalators since 1992. But these works are only a fraction of Calaboyias' oeuvre, which also includes paintings. All 29 pieces featured in his 50-year retrospective, at Shadyside's GalleriE Chiz, are pregnant with memory, and reference the artist's dueling cultural identities: Calaboyias grew up in a steadfastly Greek household in post-war America. Many of these works draw equally from both worlds, uniting Greek mythology with American mid-century minimalism. Take Calaboyias' 14-by-12-inch bronze "Bucephalus" (1972). At first glance, it resembles a series of stacked blades. However, once you know that it depicts Alexander the Great's legendary horse, a plow-shaped equine head emerges. The visual metaphor is apt, since horse and rider together harrowed a path from which Greece's Golden Age eventually blossomed. Nearby, two conjoined bronze mini-monoliths, titled "Argive I" (1998), allude to Argos, part of Greece's Peloponnese Peninsula. Other works, like the bronze "Helios" (1980), reference Greek mythology but appear more inspired by 1920s Futurism in their fanning out of repeated forms to indicate motion. Perhaps most affecting are the Henry Moore-inspired "Remember Africa I" (1962-63) and "Remember Africa, 1944" (1983). These table-sized totems draw on Calaboyias' mother's own Odyssean epic. Following the 1940 occupation of Greece, Calaboyias' mother -- pregnant with the artist and already mother of two -- fled Greece, wandered through Turkey and spent years in a Belgian Congo refugee camp. Only in 1946 was she reunited with her husband in the United States. Calaboyias seems to portray his mother's resiliency in the sculptures' strong, complex verticals, which extend resolutely upward. Calaboyias' synthesis of Modernist principles with ancient Greek mythology, so integral to the artist's personal narrative, makes for an appealing aesthetic experience.